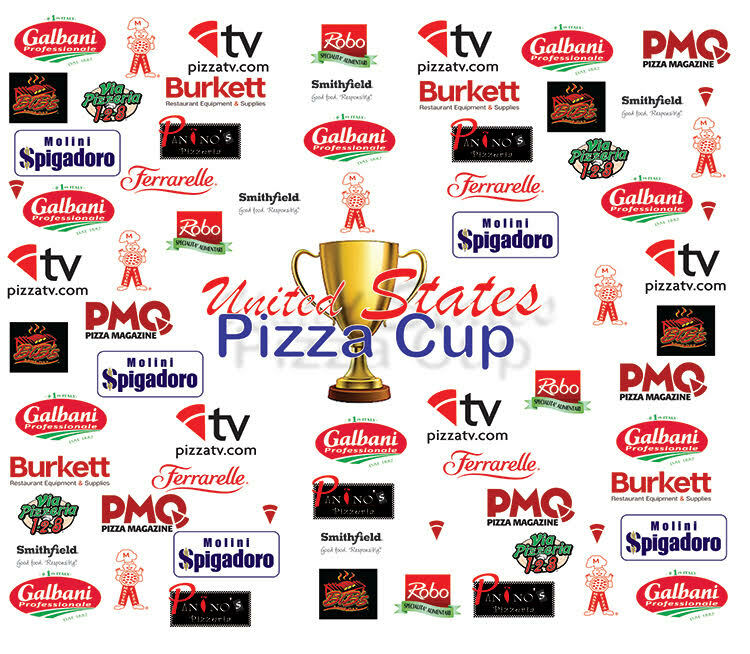 2018 U.S. Pizza Cup Northeast Trials, November 4th, Valley City, OH. 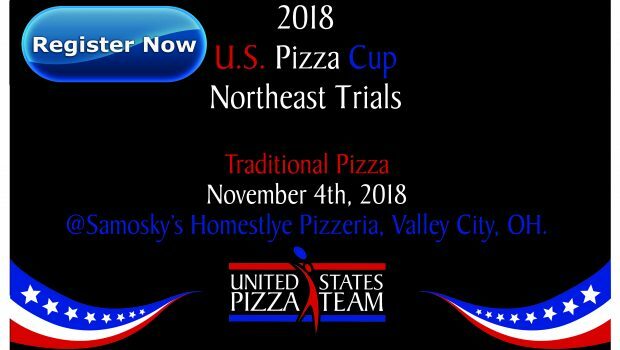 The 2018 U.S. Pizza Cup Northeast Trials will take place on November 4th at Samosky’s Homestyle Pizzeria in Valley City, OH. There will be 25 available slots to compete. 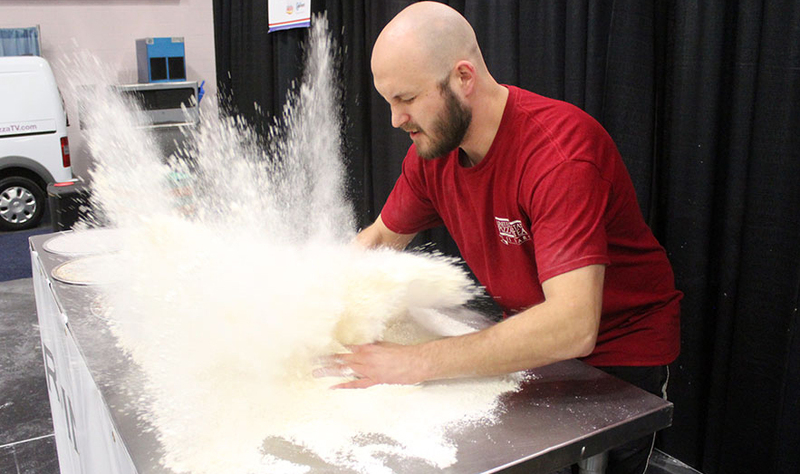 Grand Prize will be a spot on the U.S. Pizza Team as a Premiere Member and an all-expense paid trip to compete in the World Pizza Championships in Parma, Italy! This will be a Traditional Pizza event with limited toppings, requiring cheese and a red sauce base. or read them below the registration form. You can choose up to 2 of the above ingredients. You may use numerous types of one ingredient, as long as they are in the same family. i.e., Red, Yellow and Green peppers are allowed on one pie because they are all peppers. Please choose you primary oven to be used. Competition times will be chosen from lowest-highest temperatures in both oven types. Exact temps may not be achieved. This pie description is needed to verify adherence to the rules. If your DETAILED description is not submitted by the deadline of October 29th, 2018, your spot will not be held in the competition. •	You can choose up to two toppings from the following list of ingredients: Pepperoni, Sausage, Peppers, Onions, Mushrooms. •	You may use several varieties of your chosen toppings, as long as they are still in the same family, Example: Red, Yellow and Green peppers work on one pie because they are all peppers. •	Your pie must have a red sauce base. You may make your sauce with the following ingredients: Tomatoes, Basil, Oregano and other dried herbs and spices, Garlic, Unaltered Olive Oil. The sauce and all ingredients must be mixed. You may not layer these items while applying to the pizza. It must be one sauce. •	Your pie must have cheese on it. You may use different blends and types of cheese. The number of cheeses or types is not limited. •	Nothing may be added after bake except cheese and olive oil. •	Pizza may be round or rectangular but must have enough to serve 6 slices minimum. •	Pies may be made in a pan, on a screen or cooked directly on the stones of the wood oven. •	Oven types available will be a conveyor and a wood-fired oven. •	Wood-Fired temp. must be between 650°-900°, conveyor will reach 575°. •	Exact temperatures may not be reached, be prepared for a variance. •	Orders will be chosen by lowest-highest temps. •	Competitors will make ONE PIZZA. •	You will get 20 minutes of prep when you are called “on deck”. •	All pan style pizzas will be allowed to par-bake or pre-stretch your dough into your pan. This MUST BE DONE in the presence of an event organizer. All time par-baking, stretching or even moving your dough into your pan will be deducted from your 20-minute prep time. •	After your prep period, you will get 15 minutes to make your pie, NO EXCEPTIONS, Anything over results in 5-point penalty per minute. •	Time starts when you touch your dough, or for pan pizzas, when the oven judge says “Go”. 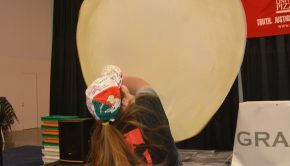 •	Upon completion of your pie, you will take a picture with your pie before presenting to the judges. 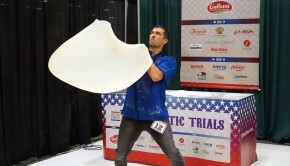 •	You must present your uncut pizza to the judges in person and field any questions they have about your recipe. You will then cut and serve each judge a slice of your choosing and an extra slice for the organizers to document your submission. •	Awards will be given directly following the event. You can choose up to two toppings from the following list of ingredients: Pepperoni, Sausage, Peppers, Onions, Mushrooms. You may use several varieties of your chosen toppings, as long as they are still in the same family, Example: Red, Yellow and Green peppers work on one pie because they are all peppers. Your pie must have a red sauce base. You may make your sauce with the following ingredients: Tomatoes, Basil, Oregano and other dried herbs and spices, Garlic, Unaltered Olive Oil. The sauce and all ingredients must be mixed. You may not layer these items while applying to the pizza. It must be one sauce. Your pie must have cheese on it. You may use different blends and types of cheese. The number of cheeses or types is not limited. Nothing may be added after bake except cheese and olive oil. Pizza may be round or rectangular, but must have enough to serve 6 slices minimum. Pies may be made in a pan, on a screen or cooked directly on the stones of the wood oven. Oven types available will be a conveyor and a wood-fired oven. Wood-Fired temp. must be between 650°-900°, conveyor will reach 575°. Exact temperatures may not be reached, be prepared for a variance. Orders will be chosen by lowest-highest temps. Competitors will make ONE PIZZA. You will get 20 minutes of prep when you are called “on deck”. 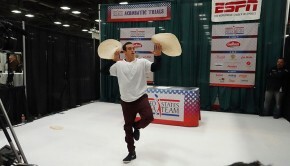 All pan style pizzas will be allowed to pre-stretch and/or par-bake your dough into your pan. This MUST BE DONE in the presence of an event organizer. All time par-baking, stretching or even moving your dough into your pan will be deducted from your 20-minute prep time. After your prep period, you will get 15 minutes to make your pie, NO EXCEPTIONS, Anything over results in 5-point penalty per minute. Time starts when you touch your dough, or for pan pizzas, when the oven judge says “Go”. Upon completion of your pie, you will take a picture with your pie before presenting to the judges. You must present your uncut pizza to the judges in person and field any questions they have about your recipe. You will then cut and serve each judge a slice of your choosing and an extra slice for the coordinators to document your submission. Awards will be given directly following the event after a brief deliberation period. 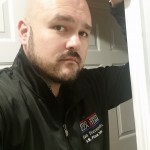 If you have any questions, please contact brian@pmq.com. A FULL DESCRIPTION of your pie MUST BE WRITTEN and SUBMITTED by no later than Monday October 29th to complete your registration. Fees are non-refundable after Nov. 3rd. If you cannot make the event after registering, notify us right away.